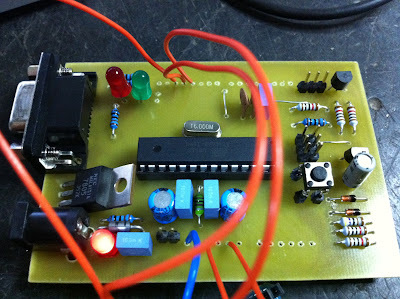 Hey ppl, this is my first time playing with arduino so I hope I got my facts straight. I've made a Arduino Severino v3 revision 2 and have an empty Mega8 and an empty Mega168. Also I got an Arduino UNO which I want to use as an ISP to burn the bootloader to the Megas. From what I have read,in order to use the UNO as an ISP I have to disable the auto-reset. 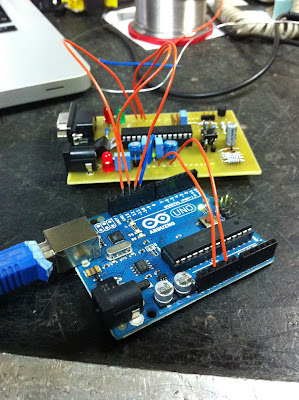 Finally I've hooked up the two arduinos as described in the playground. I have used the first method. This is were the questions start. 1) Is this the right way to hook em up? After that I upload the ISP example. 2) What type of board do select for the Mega8 and Mega168? And the upload the bootloader. 3) Am I missing something else? NOTE: Currently, you cannot use an Arduino Uno as an ISP programmer because the optiboot bootloader does not support this sketch. A revision for this is in progress. So you will have to use some other Arduino board to burn your Severino. Or use some other means, like the ICSP header. is there a definitive answer? or does it keep changing?!? 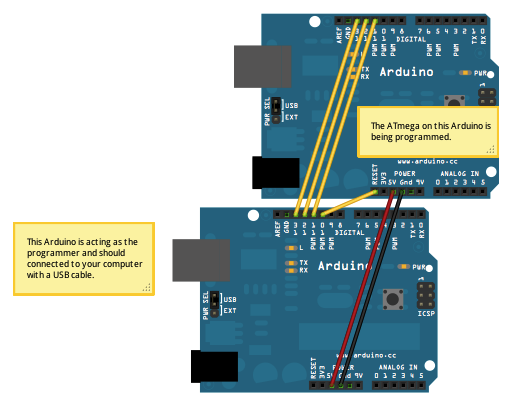 You CAN use an Arduino UNO as an ISP programmer. To make things even murkier, just for kicks I wired up my uno without disabling auto reset, or really doing anything other than ignoring the fact that an uno shouldn't work, and I've been successfully using it to bootload chips since. FWIW, I got this working tonight. 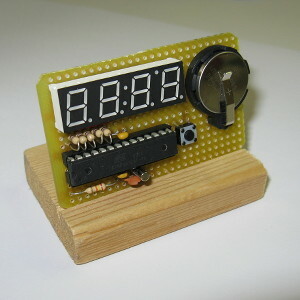 I was able to use my UNO to burn a bootloader on a new atmega 328 (http://www.sparkfun.com/products/9061) . It failed to work with the new chip (on a breadboard) setup to use the internal crystal. Adding the external 16 MHz crystal and 22pf caps got it to work.